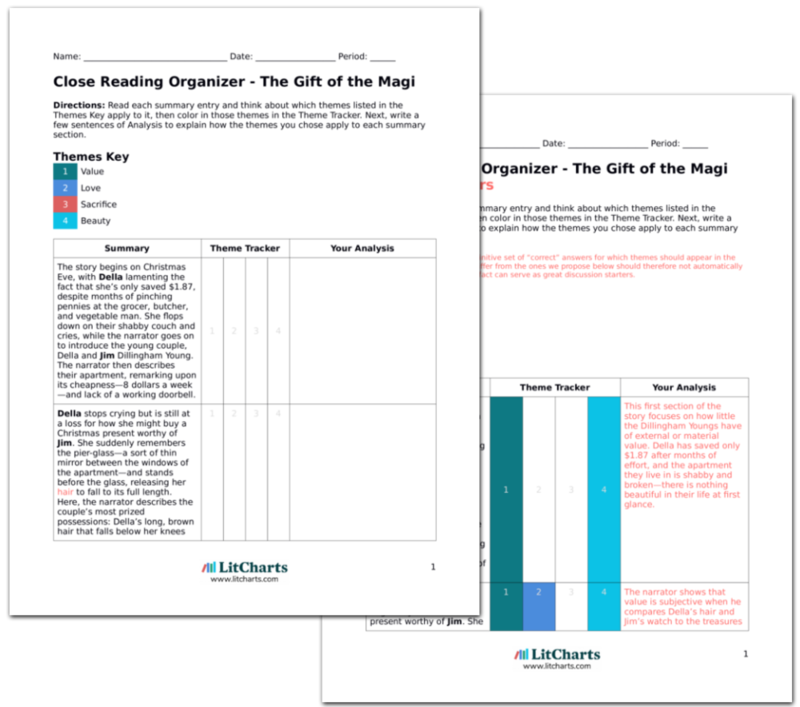 LitCharts assigns a color and icon to each theme in The Gift of the Magi, which you can use to track the themes throughout the work. “Gift of the Magi” constantly contrasts the idea of inner beauty and value with outside appearances. The story begins, for example, with a description of bleak surroundings (“a gray cat walking a gray fence in a gray background,” “shabby couch”) while hinting at a warm home life that brightens the exterior (Jim arrives home “to be greatly hugged”). When Della examines the watch chain, she also compares its exterior appearance and actual value to Jim’s own appearance and value. Both lack ornamentation, but are remarkable and beautiful for their inner substance. Della also worries that Jim will no longer find her pretty once she sells her hair—but when he sees her and recovers from the shock of her haircut, he tells her that there’s nothing in the way of “a haircut or shave or shampoo that could make me like my girl any less.” If anything, Jim appreciates the generosity of Della’s sacrifice, and the story ends on a satisfied note, with Jim sitting back on the couch and smiling. The ThemeTracker below shows where, and to what degree, the theme of Beauty appears in each section of The Gift of the Magi. Click or tap on any chapter to read its Summary & Analysis. 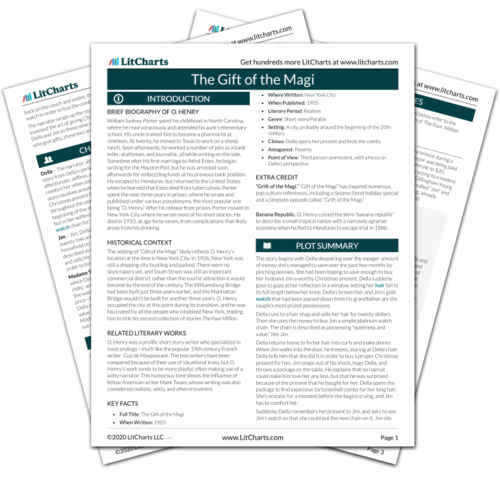 Get the entire The Gift of the Magi LitChart as a printable PDF. Below you will find the important quotes in The Gift of the Magi related to the theme of Beauty. Unlock explanations and citation info for this and every other The Gift of the Magi quote. It was a platinum fob chain simple and chaste in design, properly proclaiming its value by substance alone and not by meretricious ornamentation--as all good things should do. It was even worthy of The Watch. As soon as she saw it she knew that it must be Jim's. It was like him. Quietness and value--the description applied to both. Cao, Diana. "The Gift of the Magi Themes: Beauty." LitCharts. LitCharts LLC, 8 Nov 2013. Web. 20 Apr 2019. Cao, Diana. "The Gift of the Magi Themes: Beauty." LitCharts LLC, November 8, 2013. 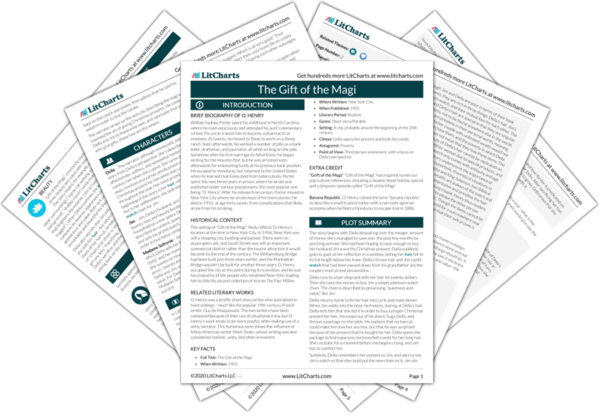 Retrieved April 20, 2019. https://www.litcharts.com/lit/the-gift-of-the-magi/themes/beauty.